A few days ago we took our youth on an outing to a nearby fun center for an hour of roller skating. As is the case in any group setting, there was different levels experience. For some it was their first time on skates. For others (myself included) we had tried before but had not quite perfected the art of moving on wheels without eventually crashing at some point. And then there are those who are really good and showed a high level of proficiency on skates. These categories sum up the various level of competency around the entire skating rink, not just in our own little group. When we first arrived there were just a few people skating, slipping, sliding, zipping, falling and stumbling their way around. As more and more people crowded the space, the risk factor and the anxiety level increased. Not just for the inexperienced but also for the experienced. Traffic is treacherous! Suddenly, I saw a young man take a terrible spill. As he tried to right himself it became evident that something was definitely wrong and he immediately yelled out, “I broke my leg.” But his plea was met with perplexing stares because he delivered the message with a smile on his face. Well is it really broken or is he joking? That seemed to be the initial response because he was wearing pants and his skates covered his ankle – both of which concealed the true extent of his injury. When we realized that he was in fact in real pain and that he needed assistance, we all jumped into action to provide him with the help and support that he needed. On Sunday I was reminded of this gem – Be kind – you don’t know what battles are being fought. On the surface people might be smiling like this poor young man was when he injured his leg but we don’t know what struggles they are enduring, what demons they are exorcising in their private hell, what trials they are fighting in silence. Some of us may be judging the situation or maybe you’re aware that there is an issue but you figure that it might not be too serious because the person bearing the weight of the hardship seems to be doing well on their own. Maybe that person has proven in the past that they are very capable of going it alone. Or maybe they have become so adept at masking the pain that those of us on the outside looking in see only the façade of calm that is concealing the anguish and hurt that they are going through every day. How much more unkindness am I piling on top of that grief with my own self-centeredness and ignorance? What words have I unknowingly said to compound the pain? They are among us. They are broken. On the outside they are a picture of happiness, maybe even perfection. But on the inside something has shattered, something has snapped or feels like it is malfunctioning, but the smile is misleading us to believe that everything is okay when all the while there is a river of ambivalence coursing through them with a swift current that is drowning their spirit and screaming out to us to reach below the surface and hold their head above water. Every day we hear of people, young and old who succumb to their private struggles. When we are finally aware of the pain that they have endured we rush in to provide the necessary help and support. Sometimes we can save them; sometimes we are too late. Then the questions of our own self-doubt begin to mount – Why didn’t I see this? What could I have done? Why didn’t they ask if they needed help? Why did it have to come to this? What kind of family or friend was I to not notice? 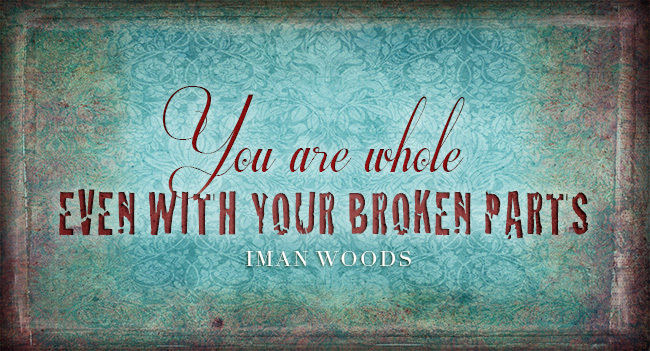 How can we recognize when someone is broken? The truth is we really don’t know until there are physical manifestations of the pain or when they finally ask. But there are things that we can do right now to help discern those in need. 1) Be approachable – You can become a life support for someone in need when you exude an aura safety and strength. 2) Be kind – No one in their right mind seeks help from a person who is angry, judgmental and patronizing. 3) Be trustworthy – One of the main reasons broken people hide their grief is because they feel like they can’t trust anyone to bear the load with them. 4) Listen – Broken people don’t want to hear your problems they want to share theirs. 5) Be direct – Don’t wait for them to ask for help and don’t beat around the bush. Take the initiative and offer help. 6) Be sensitive – Because being insensitive will only break them more. 7) Show love – You don’t have to understand what they are going through or even have to agree with them. But if you love them, whatever is broken can heal a lot faster when they know you care. 8) Be available – You pledged your support, so when they need you – be there or you’re going to be like everyone else who has offered them help and didn’t follow through. 9) Be open – When the moment is right, share your own hardships and struggles. Sometimes it helps to know that you are broken sometimes too. 10) Forget about it – When they have overcome and feel like they are mended, never bring it up again and never, never share their pain with others without their permission. We are all broken at some point in life. Don’t stand by and criticize. Don’t judge and don’t wait to jump into action. Be there to support and uplift the broken and one day they may be there for you when you are broken too. We all needed a little help mending. I love this. I needed this. Thank you. Very well said (as usual) Seti!.I enjoy reasing your blog, it’s always very insightful.